Grandma Fifi: Independent Costco and Aldi Blog: Rolf and Daughters' Carrot Marmalade; a way to use up Costco carrots? Rolf and Daughters' Carrot Marmalade; a way to use up Costco carrots? Last night my friends and I went out to eat at Rolf and Daughters, a new restaurant in Nashville's Germantown. Rolf and Daughters was named one of the best new restaurants of 2013 by Bon Appetit Magazine. We loved it: the casual vibe, the excellent and handsome waiter, the flavorful homemade pasta -a fantasy local bistro. It turns out carrot marmalade is a "thing". I tried using a carrot marmalade recipe that I found through Google. 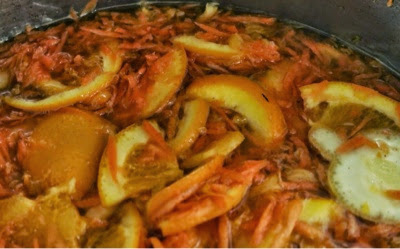 Unfortunately, the recipe I tried ended up being just like any citrus marmalade, less about carrots than the citrus flavor. I'm going to try again using only carrots and make something more like a carrot jam.